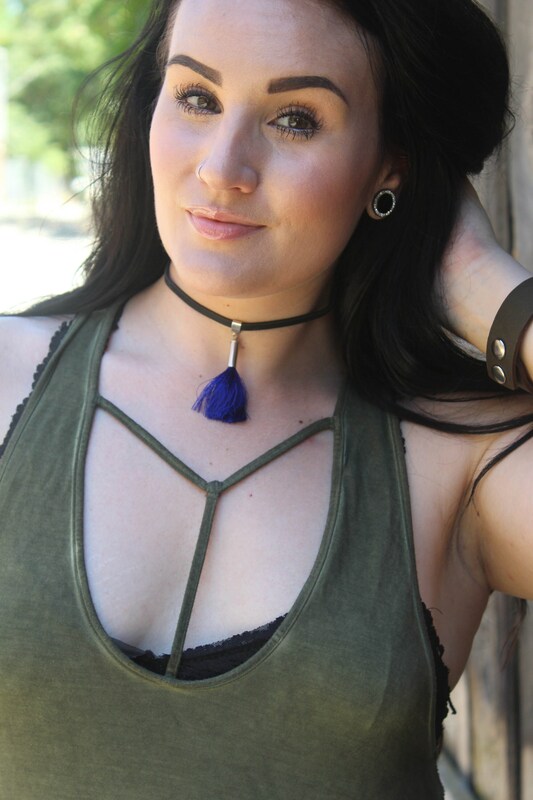 This simply tassel choker necklace is personal, unique, and extremely versitile! Several color options available for your tassel accent, allowing you to change it up while letting this simple look go a long way. Edge it out with the Cobalt Blue tassel or soften to a blush pink to match your cool Summer evening demeanor. Or, get both! The perfect accessory for your next punk/rock concert, bike run, or hot date! Feel like a total babe with this delicate arrangement of rosary beads, bullets and leather caressing your neckline. Black goes with everything, hello! Spice things up with several different color options for your tassel accent to change with your mood, outfit, or the seasons! - Genuine Leather is a fragile material, do not recommend getting wet- sweat is OK in moderation but consider this to be a special occasion necklace for the warmer months and an every day for the cooler wet months. Store in a cool dry place, not in the sun.